PR is all about building trust—with the media, with other brands, and with the public at large. Yet, by all accounts, consumers worldwide seem to be less willing to put their faith in anything—thanks, in part, to the cynicism around the “fake news” phenomenon. Indeed, recent findings show “digital distrust” is growing among consumers, who are increasingly wary of any information they find online. For social influencers, whose entire brands are built upon foundations of trust between them and their audiences, consumers’ faltering confidence may send up alarm bells. 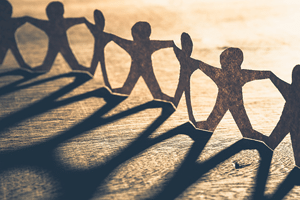 But this provides further evidence for why brands and social influencers are meant to pair up—to rebuild organic trust in consumers, drive word of mouth, and even shore up public relations efforts. Influencer marketing has come into vogue over the past few years for one very good reason: It works. Sixty-seven percent of marketers report that influencer campaigns help their brands reach more targeted audiences. And consumers see brands that partner with influencers they deeply trust in a more positive light. Though it’s by no means new, public relations is just as critical—it’s the anchor that grounds your brand story and helps you communicate a unified message. And when these two strategies are combined, brands can generate goodwill among consumers and create a positive image that drives increases in market share. One of the real benefits of influencer marketing is its ability to tap into a built-in audience. Nearly half of consumers rely on recommendations from influencers before making a purchase, while 40 percent say they’ve purchased products after seeing them used by an influencer. What’s more, 92 percent of consumers trust influencers more than advertising—or celebrity endorsements. So if influencers vouch for you, their audiences are more likely to believe them. In order to reap these benefits, however, that built-in audience must match your customer base. As it goes with any traditional PR or marketing initiative, there’s nothing to be gained from an influencer partnership that targets the wrong audience, no matter how influential that partner is among his or her demographic. For example, if your core customers are men between the ages of 25 and 40, you’d do well to find a partner with a following of a similar age range. Though most consumers have multiple social media accounts—an average of seven, to be exact—they most likely engage differently on each one. While you can pair the right influencer with the right content, the campaign will still generate minimal results if it’s hosted on the wrong channel. For instance, Instagram is a fan-favorite for influencer campaigns, as influencers themselves have identified it as a great place to connect with their community. That said, Instagram’s audience skews younger than, say, Facebook. If you’re targeting middle-aged women, focusing all your efforts on Instagram may cause you to lose out on engaging a huge segment of your audience. To improve engagement across the board, take a cross-channel approach with each campaign. When consumers see your brand on multiple channels, it creates a sense of familiarity. And when consumers are ready to make the jump from research to interaction, they’ll have the opportunity to connect with you on whichever channel they frequent most. A following of millions is impressive, there’s no denying that, but popularity doesn’t necessarily equal persuasion. An influencer’s value is in his or her ability to engage with the audience, not the sheer volume of that audience. Case in point: As the number of followers mounts, engagement rates tend to fall below 2 percent. In contrast, research has shown that influencers with smaller followings can often generate higher levels of engagement and thoughtful interaction. Someone with a following between 1,000 and 10,000, for instance, averages a 4 percent engagement rate. These “micro-influencers” host followers who are 60 percent more engaged than social celebrities. Focus your attention here. In the pursuit of better brand awareness, you want to partner with influencers whose followers are actually listening—particularly if you’re leveraging the influencer relationship to navigate rough PR waters. That built-in, highly engaged audience is great, but you can’t expect to truly reach that audience without injecting authenticity across all touchpoints. Your journey toward building a genuine relationship with your most valuable prospects doesn’t begin and end with an influencer partnership. Authenticity isn’t something you can claim, either. Instead, it manifests through your creative expressions. Ensure you’re carrying a consistent narrative across every interaction you have with consumers—from your website to social media to employee interactions to, yes, influencers. Public relations is a tried-and-true industry that’s stood the test of time, whereas influencer marketing has only emerged in recent years. At first glance, the two seem worlds apart, but both are rooted in the art of relationship-building, making them a perfect match. Sarah Clark is the CEO of public relations firm Mitchell.